Two weeks ago, we learned about the gambling ace who saddled the Tropicana Casino and Resort with a record $5.8 million loss at the blackjack tables in April. There was much speculation about his identity. Now, there is an answer. 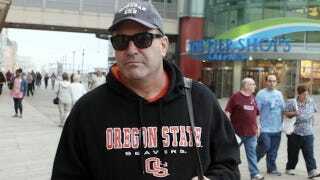 The Press of Atlantic City scored an interview with the gambler, an Oregon State fan who revealed that he'd not only crushed the Tropicana's bottom line but also hammered several other casinos during a remarkable six-month spree. His haul: $15.1 million. His name: Don Johnson. This is not the Don Johnson of Miami Vice and Aspen. Nor does it appear to be the Don Johnson of Las Vegas, the "champagne king" who orders giant bottles of bubbly. (A tipster believes that that Johnson may have been responsible for the epic bar bill we posted recently; no confirmation yet.) Rather, this is the Don Johnson of Bensalem, Pennsylvania. He is a Johnson who runs a company that uses computer-assisted wagering programs for horseracing. He sounds like a swell chap. By Johnson's account, he won $4.23 million at Caesars Atlantic City in December. Next, he conquered Borgata Hotel Casino & Spa, winning about $998,000 in December, then $1.8 million in March and April and $2.25 million over two nights later in April. Most remarkable was his haul of $5.8 million during a 12-hour spree at Tropicana Casino and Resort in April, a record loss for the casino. Multiple sources in the casino industry confirmed the accuracy of Johnson's story. "I don't wear Kevlar," he said. "I'm not bulletproof. I do have some losses in between." His huge wins capped a casino gambling career that started with him placing $25 bets at blackjack about 15 years ago. As he became more proficient, he transitioned into high-stakes wagering. At Tropicana last month, he was allowed to bet up to $100,000 a hand. "That's the highest I've ever heard of," he said. Johnson hardly fits the Hollywood image of a high roller. He is not decked out in Armani suits or Bruno Magli shoes. He does not drape himself in expensive jewelry. He dresses casually in sports attire, preferring sweatshirts, jeans, sneakers and baseball caps from casinos he's visited. His winning exploits at the blackjack tables have recently made the casinos wary. Johnson said he has been banned at the Caesars and Harrah's casinos in Nevada and was turned down by Resorts and Trump Taj Mahal Casino Resort in Atlantic City. Unlike the past, the casinos are no longer willing to give him a 20 percent discount on his losses or shower him with other high-roller perks, he explained. "I don't think they will let me play anymore," he said of the Atlantic City casinos. "But it's not going to change my life. If I don't play blackjack, I'll just go to the horse races."